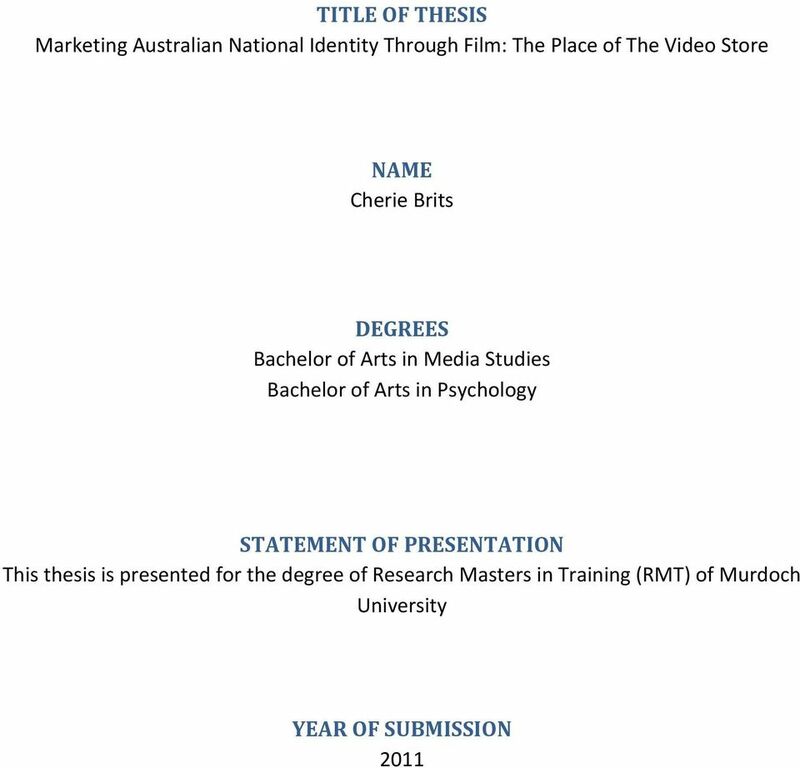 Download "TITLE OF THESIS Marketing Australian National Identity Through Film: The Place of The Video Store. NAME Cherie Brits"
3 3 ABSTRACT Video stores are one of the main sources of entertainment within Australia today. The films borrowed and sold portray varying cultures, issues and opinions. Assumptions of the educational efficacy of Australian films have always been bumped up against assertions of commercially produced Australian films as mere entertainment. Films are borrowed or bought for diverse reasons but since nationalism is often buttressed by narratives, the video store itself can be used as an instrument to promote and even measure cultural identity. 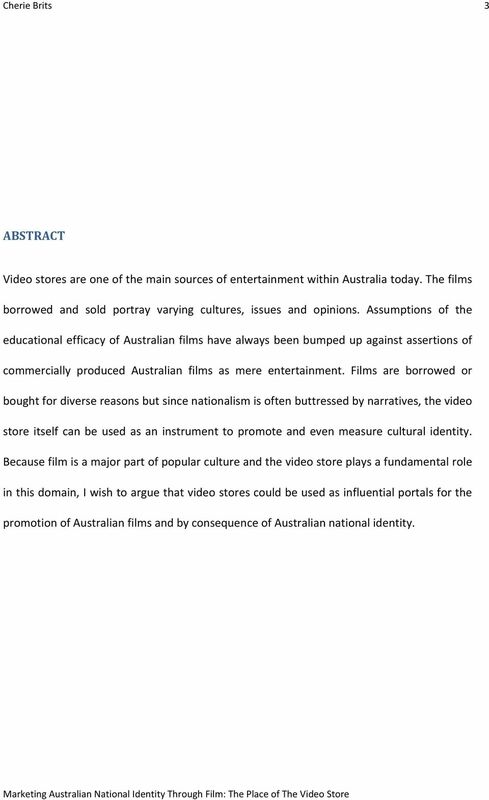 Because film is a major part of popular culture and the video store plays a fundamental role in this domain, I wish to argue that video stores could be used as influential portals for the promotion of Australian films and by consequence of Australian national identity. 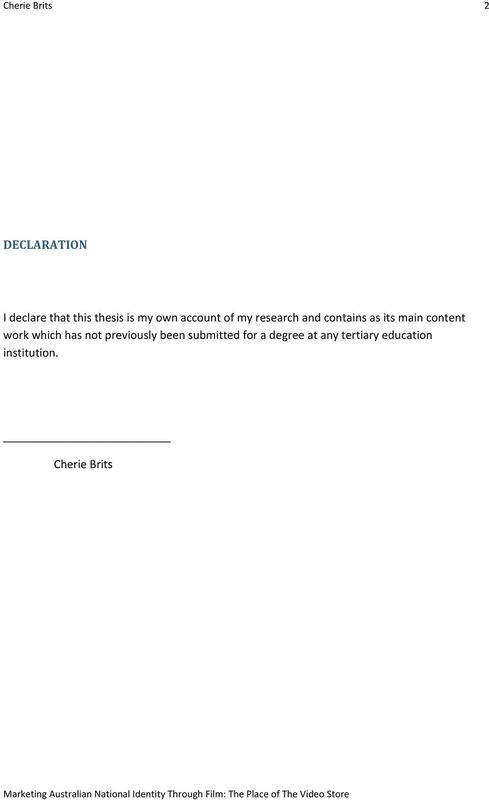 5 5 ACKNOWLEDGEMENTS This dissertation would not have been possible without the support of many people. I wish to express my gratitude to my supervisor, Assoc. 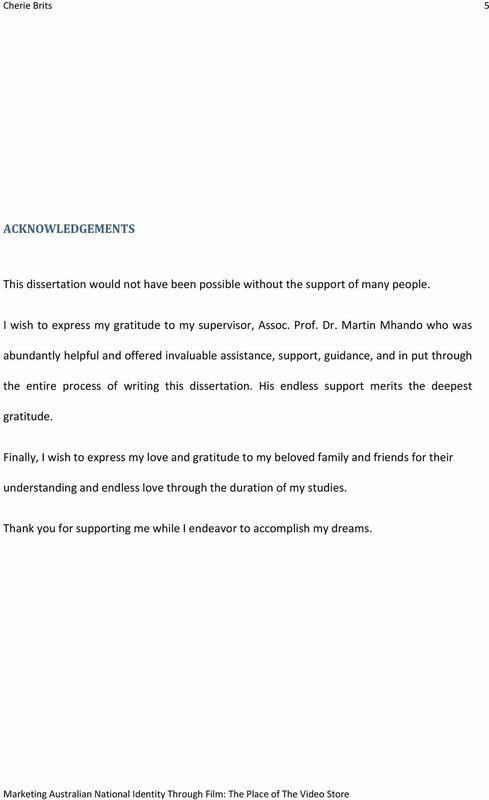 Prof. Dr. Martin Mhando who was abundantly helpful and offered invaluable assistance, support, guidance, and in put through the entire process of writing this dissertation. His endless support merits the deepest gratitude. Finally, I wish to express my love and gratitude to my beloved family and friends for their understanding and endless love through the duration of my studies. Thank you for supporting me while I endeavor to accomplish my dreams. 6 6 INTRODUCTION Despite the prevalence and importance of video stores in contemporary society, media research has surprisingly little to say about them. 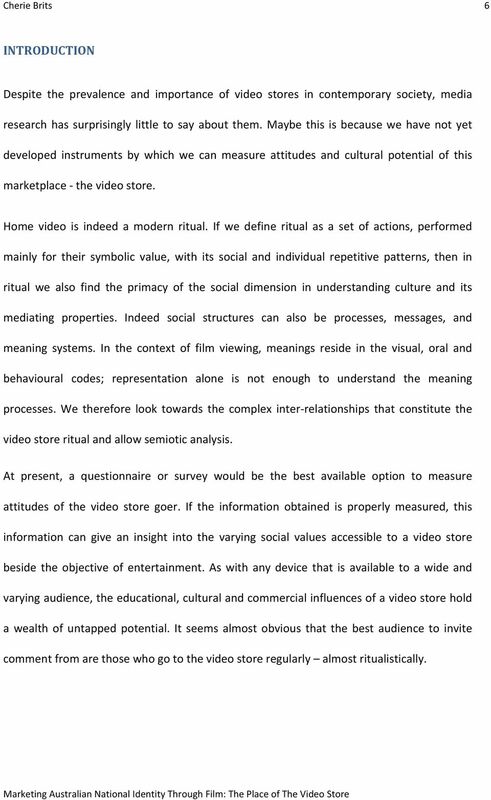 Maybe this is because we have not yet developed instruments by which we can measure attitudes and cultural potential of this marketplace - the video store. Home video is indeed a modern ritual. If we define ritual as a set of actions, performed mainly for their symbolic value, with its social and individual repetitive patterns, then in ritual we also find the primacy of the social dimension in understanding culture and its mediating properties. Indeed social structures can also be processes, messages, and meaning systems. In the context of film viewing, meanings reside in the visual, oral and behavioural codes; representation alone is not enough to understand the meaning processes. We therefore look towards the complex inter- relationships that constitute the video store ritual and allow semiotic analysis. At present, a questionnaire or survey would be the best available option to measure attitudes of the video store goer. If the information obtained is properly measured, this information can give an insight into the varying social values accessible to a video store beside the objective of entertainment. As with any device that is available to a wide and varying audience, the educational, cultural and commercial influences of a video store hold a wealth of untapped potential. It seems almost obvious that the best audience to invite comment from are those who go to the video store regularly almost ritualistically. 8 8 the retail marketability of film and more recently video games. In fact, the AVRRA (Australian Video Rental Retailers Association) has launched a weekly ratings list that reveals the Top 20 movie rentals in demand for a particular week. 1 The ratings are derived by counting every movie title hired in a sample of more than 100 stores across three chains of video stores. Most importantly the ratings include urban and rural locations therefore encapsulating a wide consumer demographic. This is a true example of instruments and available data that could be used to advance and promote Australian film and thus Australian film identity. 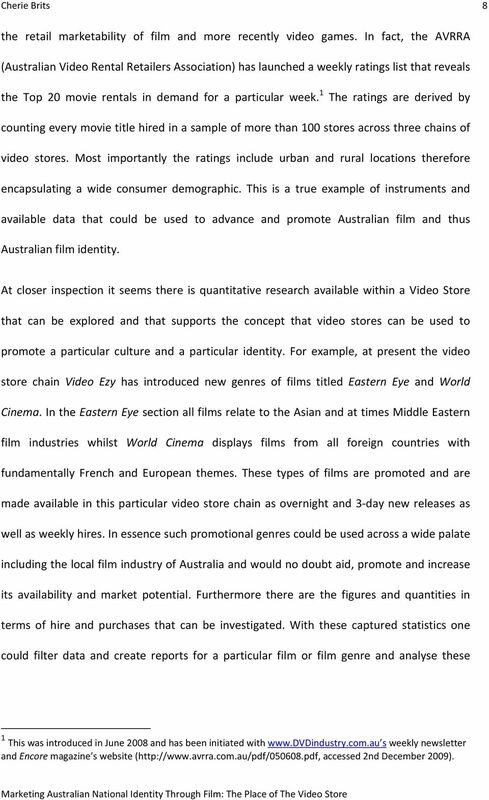 At closer inspection it seems there is quantitative research available within a Video Store that can be explored and that supports the concept that video stores can be used to promote a particular culture and a particular identity. For example, at present the video store chain Video Ezy has introduced new genres of films titled Eastern Eye and World Cinema. In the Eastern Eye section all films relate to the Asian and at times Middle Eastern film industries whilst World Cinema displays films from all foreign countries with fundamentally French and European themes. These types of films are promoted and are made available in this particular video store chain as overnight and 3- day new releases as well as weekly hires. In essence such promotional genres could be used across a wide palate including the local film industry of Australia and would no doubt aid, promote and increase its availability and market potential. Furthermore there are the figures and quantities in terms of hire and purchases that can be investigated. With these captured statistics one could filter data and create reports for a particular film or film genre and analyse these 1 This was introduced in June 2008 and has been initiated with s weekly newsletter and Encore magazine s website ( accessed 2nd December 2009). 10 10 of consumers' experiences that often remain overlooked by marketers using exclusively empirical methods. 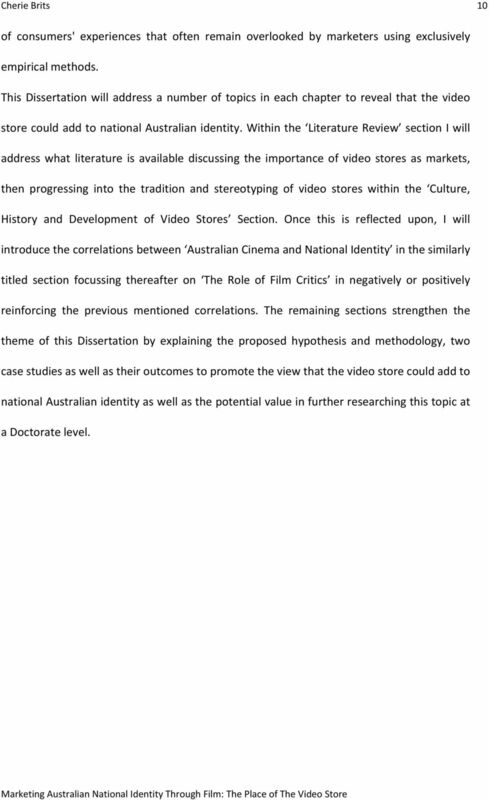 This Dissertation will address a number of topics in each chapter to reveal that the video store could add to national Australian identity. Within the Literature Review section I will address what literature is available discussing the importance of video stores as markets, then progressing into the tradition and stereotyping of video stores within the Culture, History and Development of Video Stores Section. 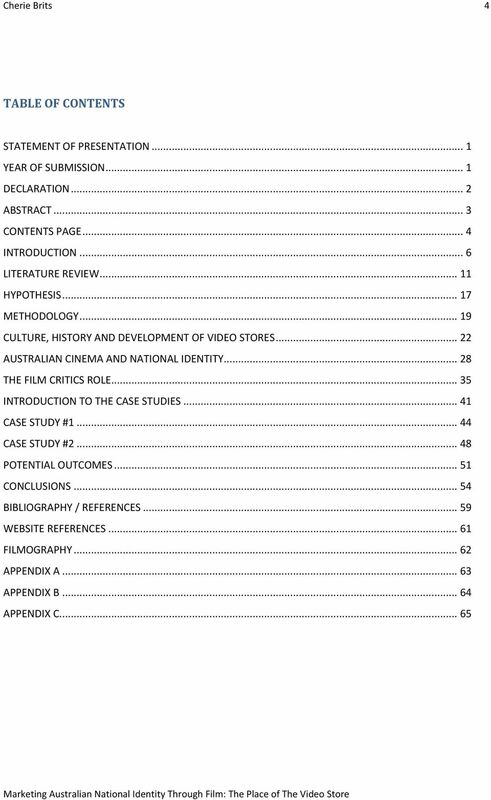 Once this is reflected upon, I will introduce the correlations between Australian Cinema and National Identity in the similarly titled section focussing thereafter on The Role of Film Critics in negatively or positively reinforcing the previous mentioned correlations. 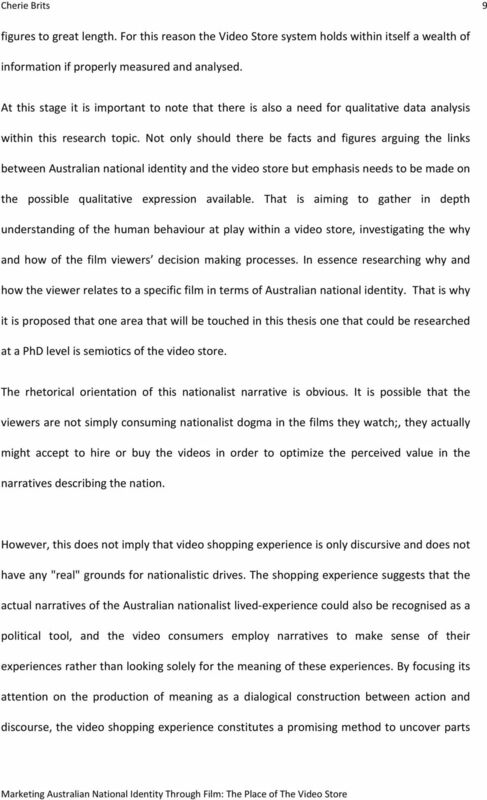 The remaining sections strengthen the theme of this Dissertation by explaining the proposed hypothesis and methodology, two case studies as well as their outcomes to promote the view that the video store could add to national Australian identity as well as the potential value in further researching this topic at a Doctorate level. AN EXAMINATION OF PERCEIVED RISK AND TRUST AS DETERMINANTS OF ONLINE PURCHASING BEHAVIOUR: A STUDY WITHIN THE U.S.A.
What Do Buyers Really Want When They Purchase Organic Foods? An investigation using product attributes. GCSE Film Studies Guidance & Frequently Asked Questions 1 Exploring genre (Paper 1) Encourage students to be as focused as possible in their examination answers particularly in answers with extended writing. The Generation Z Report: Technology in the Lives of Australia s Under 18s. La Haine. Despite all this, audiences loved it and ten years later a special anniversary edition has been released at the cinema. Abstract: Australian Values, Immigration and Identities Integrating or Belonging? When enough is enough Donna Bonde research by design About this White Paper The purpose of this white paper is to guide market research professionals on how many interviews are needed in qualitative research. LINKOPIG UNIVERSITY. Documentary Film. Vernacular Learning A need or desire? Missing Trees: The Inside Story of an Outdoor Nation Key Findings. A research report commissioned by Planet Ark and sponsored by Toyota Australia. Proposal for Communication Ph.D. at UC Davis 8 6. Administration of the Program The program will be administered by the Department of Communication, which is currently administering the Communication M.A.